I said at the end of my last post that Dora the hawk manages to avoid my camera. This is true...I see her often, but she is either far away, perched in a tree full of obstructive leaves and branches, or is just too quick for me. 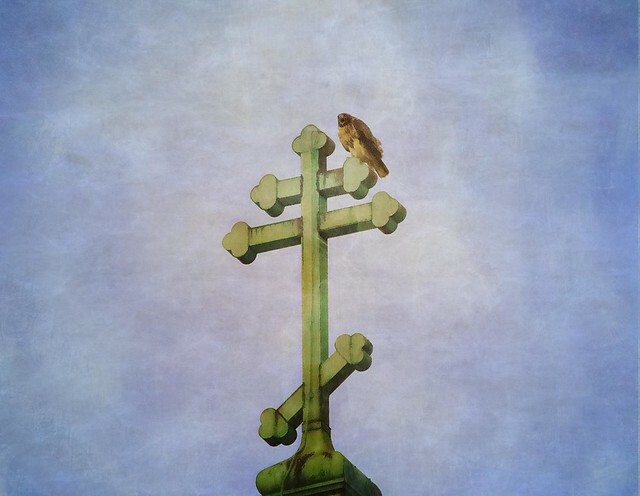 The closest I'm usually able to get to her is when she's perched on the cross of St Brigid's on Avenue B and 8th Street. So I was really happy to spend some time with her this last weekend as she and Christo defended their territory against invaders. 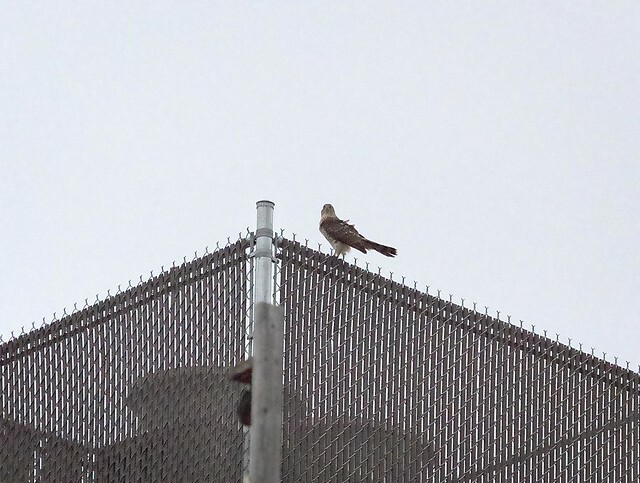 Some of these intruders were other hawks, like this Cooper's who thought s/he could get away with passing through Tompkins Square. 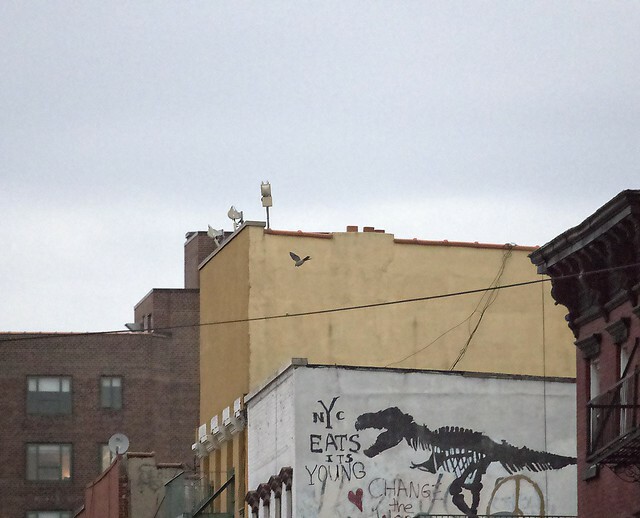 After sunset on Friday, the Cooper's flew through the center of the park and landed on a rooftop on Avenue A and 11th Street. 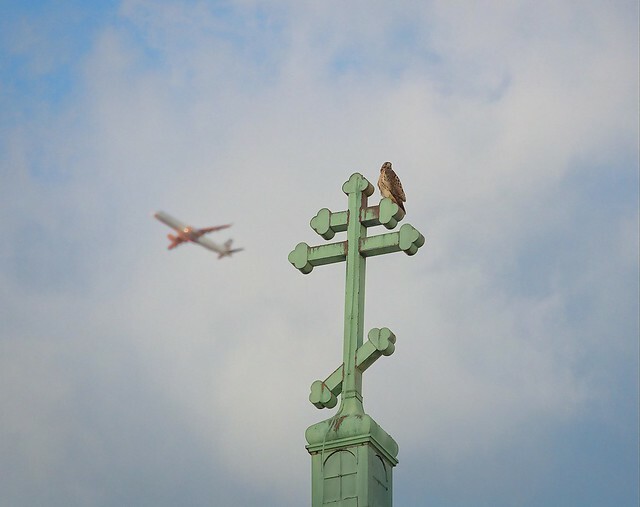 It was only able to rest about a minute before a red-tail (who I presume to be Dora because Christo was in a different location at that time) came swooping in from the west and chased it up the avenue towards Stuyvesant Town. I didn't see the Cooper's again, but did see at least two other traveling red-tails over the weekend. 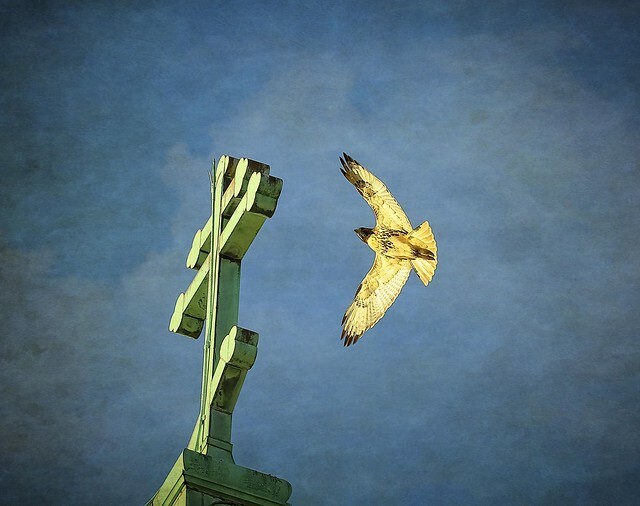 Christo and Dora's high-pitched hawk screams could easily be heard high above the streets. Dora was spotted doing some border patrol along First Avenue, which seems to be the western boundary of their territory. They do/can go further west, but I most often see them sticking east of this line. 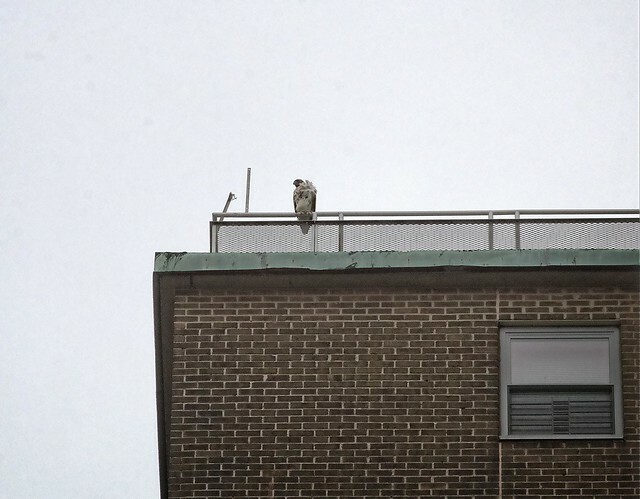 Here, Dora perches on their favorite lookout on top of the Village View apartments on First Avenue and 4th Street. And here she is two blocks north, on Village View at 6th Street. From here, she took off up the avenue towards Beth Israel hospital. 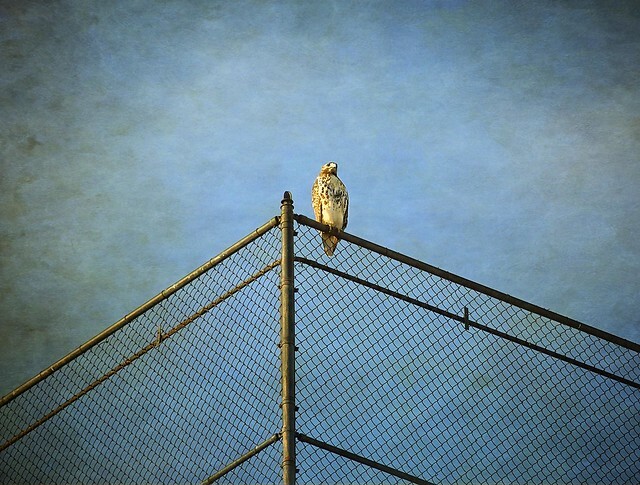 I've often wondered if our hawks hang out on the tall buildings there, but I've never seen them that far north. 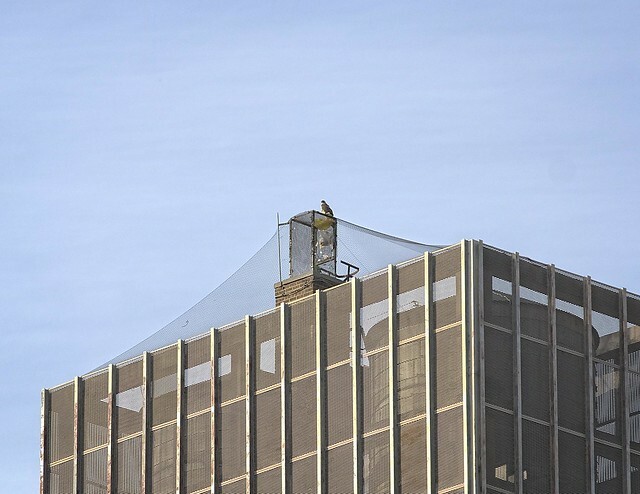 Another place I've seen Dora perched quite often is on the fence atop the Boys Club on Avenue A and 10th Street. 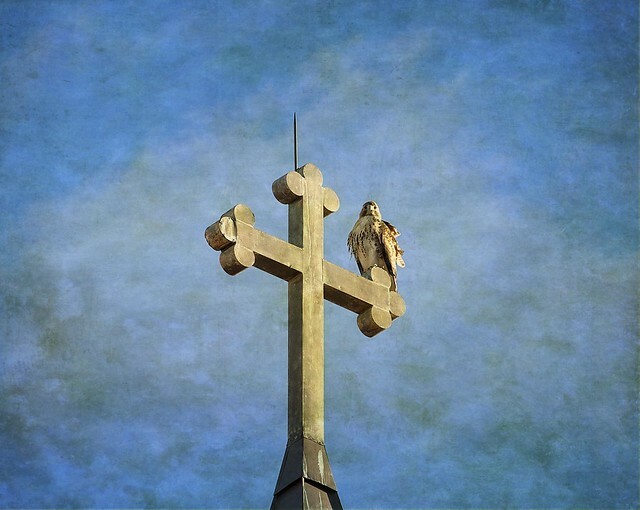 From there, it's an easy flight across the street to the cross of St Nicholas of Myra. 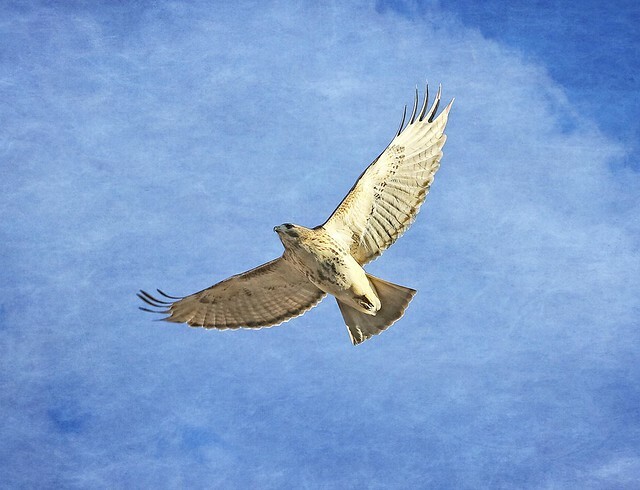 Meanwhile, migrating jets were allowed to pass through hawk territory without incident. As it was late in the day, and the park secure, Dora took off for parts unknown.